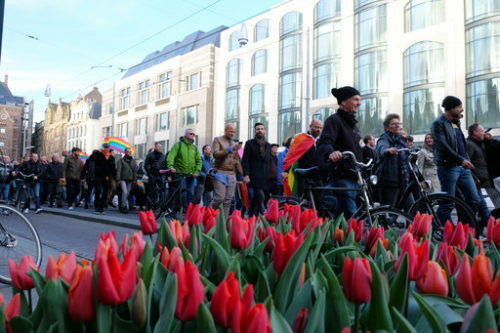 Hundreds of people walked hand-in-hand through Amsterdam on Wednesday to show solidarity with two gay men who were badly beaten over the weekend in the eastern city of Arnhem. The peaceful march was part of a national outpouring of emotion over the beating of the married couple by a group of youths. The men told police the confrontation started because they were holding hands. Five suspects, all in their teens, will be charged Thursday with causing serious bodily harm, prosecutors said, adding that they are still investigating the motive of the attack. Marcher Marion van Hees, 68, said she campaigned for gay rights during the 1960s.